Who knew that the concept even existed, let alone was a recognized style trend. 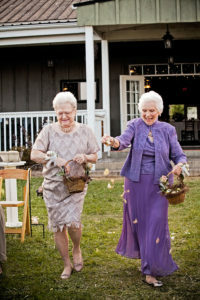 But that uber-arbiter of approachable hip, the New York Times Style Section, has alerted us to the possibility of grannies walking down the aisle as bridesmaids or even flower girls. And these are not the “young old” either. The sensibly-shod but formally-dressed women profiled in the Times range in age from their 70s to their mid 90s. And we thought that flower girls were supposed to be about fecundity! You never know what a toddler will decide to do on that long walk under the eyes of strangers. But Grandma? She sort of defines known quantity. As you might guess, the grandmothers chosen for this spotlight moment are women who have remained close to their granddaughters-the-brides. Other requirements? Flexibility in relationships and role shifts, as well as an ability to actually make it down the aisle. Thanks, Hilary, for putting a human face on such a common quandary. We may not all be presidential material — for some of us it might only be a question of becoming senator or CEO, or maybe just picking up an Oscar for lifetime achievement. But which of us doesn’t identify with Hilary’s predicament? Just when the stars might align to give her a shot at the White House — and we’re talking the big desk, not the namby pamby family quarters — her only child goes ahead and…well, goes ahead with her own timeline, her own life. It is easy for Bill to say that he only wants to live to be a grandfather; he already has had his turn as leader of the free world. 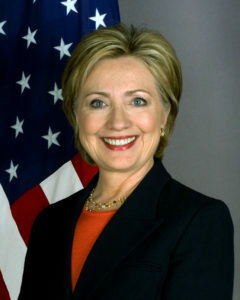 For Hilary, as for so many women, that career trajectory may have been delayed by Mommy-tracking, or the long slow rise of confidence- or skill-building. Which of us doesn’t have her own version of the health care disaster? Or hasn’t spent some piece of her best years wondering: hair band or no? Being Secretary of State was ok, but darn it, we still have plans! But the if-ness and the when-ness of our grandmotherhood is totally beyond our control. It’s the Zen lesson of the universe. That said, we can’t help but wonder: if all works according to plan, will Hilary find room in the Oval Office for a porta-crib?